Child pedestrian accidents in Los Angeles are still a huge problem. Greater L.A. has a population of approximately 4,000,000 and about 30 percent of those people are under the age of 18. Los Angeles Unified School District (LAUSD) is the second largest public school system in the U.S. and has almost 700,000 active students. When kids are at play or going to and from school, they inevitably have to cross the street or many streets including some of our more congested thoroughfares in areas with a high amount of school age children like the L.A. basin and the San Fernando Valley. In fact, nationwide almost two thirds of pedestrian accidents occur on urban roads like our found in The Southland. Night Time and Weekend Accidents: While one might think that many children are injured or killed playing out in the street or getting on and off the school bus, in fact, the majority of pedestrian mishaps involving children occur at night and on the weekends. In fact, for kids under the age of 16, 40 percent of accidents causing injury or death while on foot occur between the hours of 5 p.m. and 9 p.m. The evening hours (especially in the shorter fall and winter months) have low light and diminished visibility. This is a major factor for drivers not seeing pedestrians and striking them with their vehicle. Alcohol Related Incidents: A large percentage of pedestrian accidents involve drivers or pedestrians under the influence of alcohol or drugs. This reduces the perception and reaction times of both motor vehicle operators and persons walking, skating or riding skate boards in and around roadways. 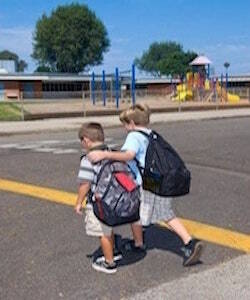 Dart Outs: The dart-and-dash is one of the more common ways that children are struck by cars. Urban areas tend to have a higher traffic volume and many busy streets like Ventura Boulevard or Santa Monica Blvd. have parking lanes on either side of the street leaving room between cars for smaller children to run out into the road between vehicles. Intersection and Crosswalk Mishaps: While many incidents occur between intersections, there are many more that occur while a child is attempting to cross the street at an intersection within a crosswalk. School crossing guards and other safety measures can reduce the chance of this happening but, there are still hundreds of incidents of children being hit crossing the street in urban areas like Los Angeles every year. The general laws of negligence apply to drivers who are involved in pedestrian accidents with children if the child is injured or killed. This means that a motor vehicle operator may be liable for civil damages including past and future medical expenses and physical pain and emotional distress related to an auto accident if that driver was negligent (i.e. they failed to use reasonable care in the operation, maintenance or ownership of their motor vehicle). This can include driving carelessly, getting behind the wheel drunk or stoned, or even loaning their car to a person whom they should know was incompetent to drive. In the case of commercial vehicles like trucks and cargo vans, the business entity who employs the driver may be found liable if they operator was on the job and “within the course and scope” of his employment at the time of the incident. The names, addresses, and phone numbers for any driver involved, any passengers and all witnesses should be obtained at the scene of the accident. Police will usually obtain this information but, the parent or guardian should also make sure they have at least names and phone numbers for EVERY person who may have been involved or who may have seen the incident. Prompt medical care should be sought and doctor’s instructions on follow up visits to specialists like Orthopedists or Neurologists and prescriptions for diagnostic studies like x-rays, CT scans or MRI s should be followed to the letter. No statements should be given to any person or any insurance representative about how the accident occurred or injuries sustained without the assistance of counsel. A quality personal injury attorney should be consulted and retained to assist in the handling of any claims for personal injury or wrongful death that result from the pedestrian accident.